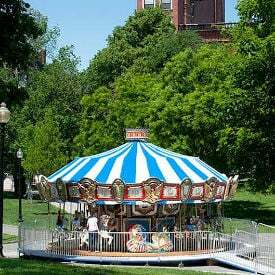 Adjacent to the Frog Pond, the Carousel is an American masterpiece built by the Chance Morgan Ride Company of Wichita, Kansas. Join in for a ride with the zany carousel characters. The Carousel is open to the public seven days a week, weather permitting. An oak floor, beveled glass mirrors, and a standard pie top with a lighted crown all give the Carousel a classic style. The Carousel features a variety of Bradley and Kaye horses, wildlife figures, and a chariot. It was named one of “America’s Best Carousels” by Travel and Leisure in May of 2012. Enjoy an old-fashioned carousel ride from mid-April to the end of October. The carousel is handicapped accessible. Individuals of all ages are encouraged to take advantage of this handicapped accessible attraction. Anyone under 42 inches must be accompanied by an adult. Built in 1947 by the Allan Herschell Company of North Tonawanda, NY. The Allan Herschell Company, the most prolific maker of carousels, specialized in producing portable machines which could be used by traveling carnival operators. The Company produced over 3,000 hand carved wooden carousels and out-produced all of its rivals in the carousel industry. Beginning in 1873, Allan Herschell was a partner in several companies manufacturing carousels. In 1915 he started the Allan Herschell Company which operated independently until it was sold in the early 1970’s to a rival maker of amusement rides. A museum exists in the original manufacturing facility in North Tonawanda. For more information, please call the Frog Pond at (617) 635-2120. Friday and Saturdays to 10:00am to 8:00pm. $3 for a three minute ride or $25 for a 10-ride pass; no charge for adult standing w/child. (One adult per child). A strip of ten tickets is available for $20.00. Hand-held infants and toddlers are not permitted - they must be either in a carrier (such as a BabyBjorn) or seated on the ride.